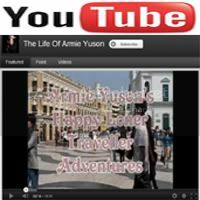 I discovered my passion for writing at the age of 9 years old and I discovered my thirst for travelling and extreme adventures at the age of 22. 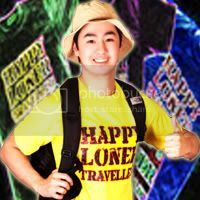 I’ve been touring around the Philippines, from Batanes to the southernmost tip of Mindanao for 5 years already and I have seen, felt and experienced a lot. Mostly, what our fellow Filipinos have been going through in terms of poverty. So I have built my advocacies through the shout of our fellow Filipinos, I condoled with their calling to our government. And I used what I already have, which is my love for writing, movie making, photography and travelling, I came up with my 3 missions in life and that is to promote Philippine tourism, so that I could allow more job opportunities in the tourism industry to open for our fellow Filipinos in dire need of a livelihood and to teach everyone to protect and conserve our Mother Earth & its dying Natural Resources. For more than 2 years, I’ve been blogging about my advocacies, exploring and featuring off the beaten track Philippine Destinations that would add new flavors to Philippine Tourism. And also in between, I share my personal struggles and achievements in life so that I could somehow inspire my readers that behind every pain, misery, cruelty, heartache and mistakes in our lives, there is always hope, joy, love, positivity and acceptance. I guess, Life is really like that, you always have problems, but what’s important is how you remain to stand, fight and take the challenges of those problems and when we win? There’s nothing sweeter than a Big Knockout Victory! So I’m thanking God for finally giving all my 2 year hardwork the recognition it deserves, because God knew all the effort I gave to built my world on what it is today ARMIEYUSON.BLOGSPOT.COM. Finally, my voice have been heard after 2 years of blood, sweat and tears. Philippine Blog Awards 2011, the most prestigious award giving body in Philippine Blogging has given me a news that would literally make me cry and jump for so much joy! And that is after 5 months of waiting, I was announced to be a finalist in 6 awards. And that is in the Reader’s Choice Award 2011, Blogger’s Choice Award 2011, Travel Category 2011, Lifestyle Category 2011, Podcast & Videocast Category 2011 and Top Single Podcast & Videocast Category 2011. Praise God!!! Just being a finalist feels like a winner already because hundreds of thousands of entries were nominated and it faced 3 gruesome processes just to be cutdown to the finalist part that comprises of 5 to 10 contestants only. 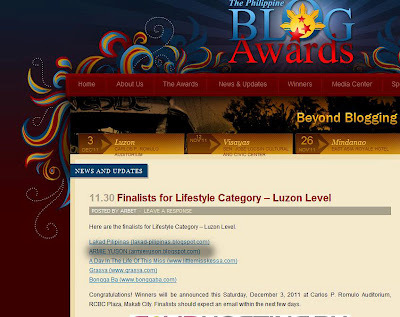 It’s already a Big privilege for me just to be included in the list of the Top and Elite Bloggers in the Philippines. There will be more opportunities coming your way Armie. You have such a very informative blog and am pretty sure it deserve to be recognized sooner than later. I am reading your articles and I can always feel its sincerity. Cheers! 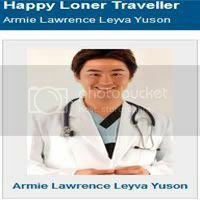 Happy Loner Traveller & His Armieholic Friends!! !